Can we have our boat back now!?! Wow! Who would have thought “Pablo” would be in the boatyard this long? Certainly, not us. What was that lesson learned about everything taking three times as long? We got the call that “Pablo” would be ready by Friday to put back into the water. Wahoo! So we left Santa Cruz early Thursday morning giddy with excitement. Halfway down the highway we get a call from the boatyard that she is not ready. What!?! Well, we were halfway there and we were coming. So we will see you shortly we said with all the politeness we could muster. After arriving we find that the engine mechanic is still working on installing the new motor. He might be done by Friday afternoon if he pushes. Steve and I, frustrated, check into a hotel. We would be back at the yard in the morning to check on the progress. We were now like a dog with a bone and we were not letting go. We got to the yard around 9:00am. The mechanic did not show up until almost 10:00am. He let us know he should be done by 11:00 if everything goes well. Great! 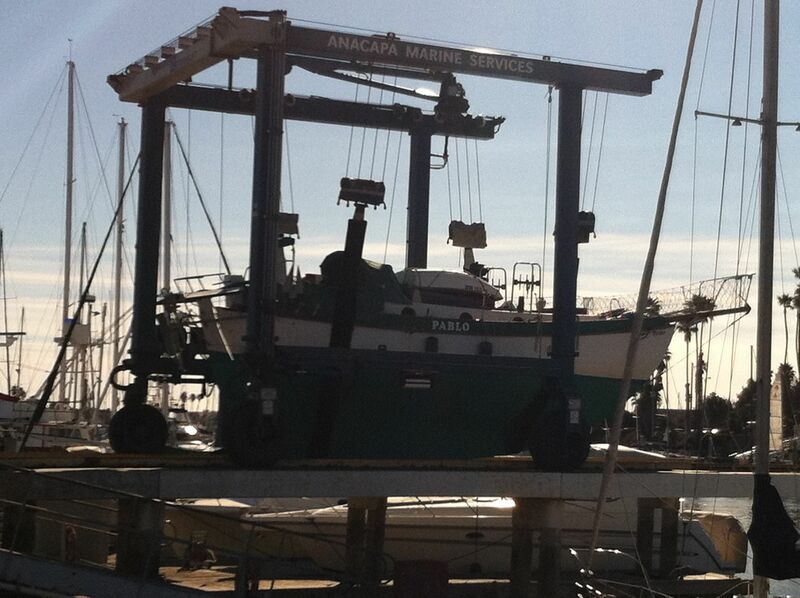 We got ahold of the rigger (the mast has to be re-stepped before we can move the boat). The rigger says no problem if she goes in by noon. So, Steve and I go for a walk and putter about. Back to the yard by 11:00. Ready yet? No. Ugh! The rigger is there and lets us know he has to take his daughter to the dentist at 2:00. Now the conversation turns to the idea that the boat will not go into the water until Monday. What? No way! Somehow through all of this Steve and I remain calm and pleasant. We explain that we will not be here on Monday and that if we do not get her into the water today we will not be back for a few weeks (those home obligations. Work, family, friends. We are living a dual life) In the end the rigger comes back after his daughters dentist appointment, the yard crew works after hours, and we are stepping the mast by spotlight and can only jury rig the rigging enough to get her back to her slip in the morning. Steve and I slept on the boat in the ways. After all the frustration and last minute chaos it was good to have her floating again. The whole ordeal was not any one person’s fault. There was so much to coordinate. I am sure that Steve and I being 5 hours away did not help matters. We learned to stay calm and to remain kind to others. It was probably our polite behavior that endeared us to the mechanic, yard staff and rigger that got us into the water today. People did not have to stay late nor did they have to go that extra mile. They did it because they chose to. And we are grateful. This entry was posted in Uncategorized and tagged Channel Islands, Learning. Bookmark the permalink.